In October, when I pitched a Quebec New Year’s Eve trip to my wife and friends, I was met with more than a fair amount of skepticism about the merits of a winter trip to a famously cold destination. Ultimately I was able to convince a group of six to commit to the trip—my wife, her sister, three of their friends, and myself. By Christmas the forecast revealed that we were in for a bit more than I’d bargained for in the cold weather department. A strong polar vortex was bringing freezing temperatures as far south as Florida. In Quebec, the temperatures were predicted to be colder than the South Pole. (Yes I know it’s summer there right now, but still—it’s the freaking South Pole!) I advised the group on how to prepare for the impossibly cold weather, assuaged their concerns about turning into human popsicles, and we caravanned northward to the land of maple syrup, hockey and poutine. 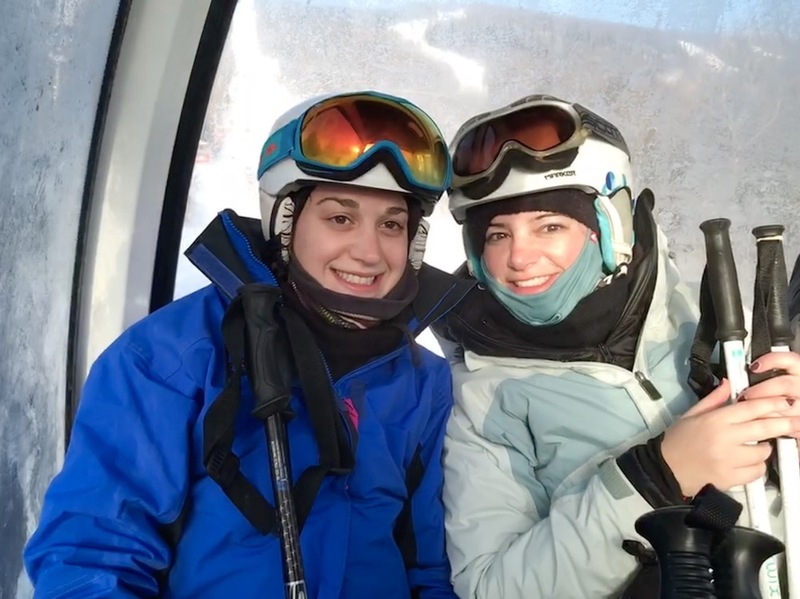 Our first day of skiing was at Mont Sainte Anne, a large resort located 30 minutes east of Quebec City on the northern shore of the mighty, completely frozen Saint Lawrence River. We were greeted with a frigid bluebird day and virtually no crowds. I got a head start while the rest of the group booted and suited up, and I headed straight for the steep moguls under the gondola. I don’t normally ski with my face covered, so my goggles fogged up and then froze solid. This made for some challenging semi-blind mogul skiing that fell somewhere between bewildering and terrifying. A fellow passenger on my next gondola ride advises me to thaw the goggles inside my coat then wipe them dry with a tissue—great advice that honestly saved the remainder of the trip for me. I met up with the ladies to ski the groomers and soak in the views, but when they called it a day I headed back to the steeps and the trees. The snow was firm, chalky packed powder, and I had a great time bouncing around the widely spaced and well-covered glades. After lunch I took a few more runs with my sister-in-law, Michelle, and then we called it a day. After warming up at the house with some mulled wine (a personal favorite for sub-zero group trips), we took a taxi into the old city for some incredible food. During our trip we ate dinner at Chez Boulay, La Planque, and Le Clocher Penché. All were absolutely fantastic and deserving of their own article, but this is a ski blog so I won’t digress too much. 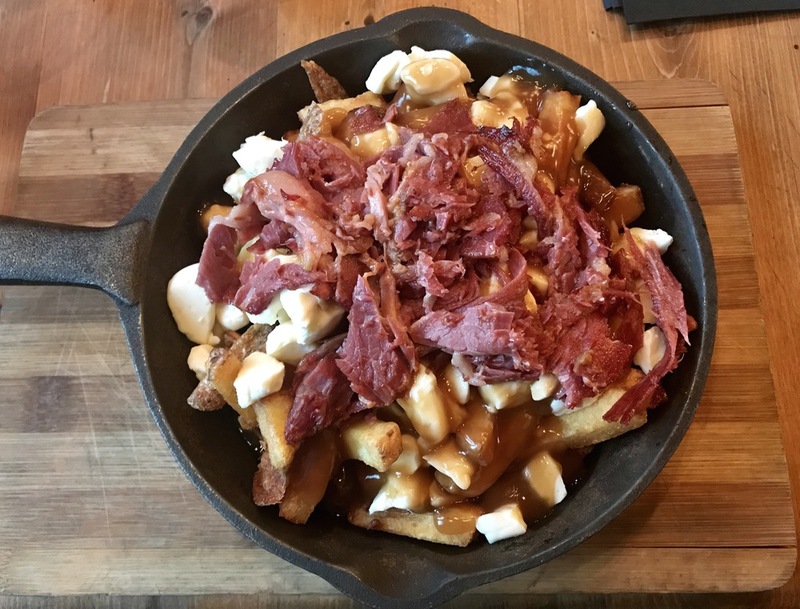 I will say though that my favorite dishes were seal tataki, octopus terrine, braised beef cheeks, pudding chomeur and, of course, poutine with smoked meat. The old city was still completely covered with Christmas lights which, combined with the 18th-century architecture, formed a quaint and magical scene that appeared almost like a movie set. On the second day the ladies signed up for a food tour in the Old City. Desperately needing a break from the indulgent, interminable eating in which I’d been engaging since Christmas Eve, I elected instead to venture off to Massif du Sud on my own for a day of tree skiing south of the river. The 90-minute drive took me through a flat and rural landscape where the locals were primarily traveling via snowmobile. When I arrived at Massif du Sud, the thermometer in my car read -15 degrees, and the entire mountain was north-facing (read: shady, windy and cold). Needless to say, this was the most challenging ski day of the trip. I took a break every few runs to thaw my frozen limbs, and I stuck mostly to the trees to avoid the arctic wind. Oddly enough, in spite of the fact that 40% of the mountain’s trails are glades, the locals stuck almost exclusively to the groomers. I saw only two people the entire day as I explored the steep and open glades that spanned the entire mountain, and I even found a surprising amount of leftover powder. 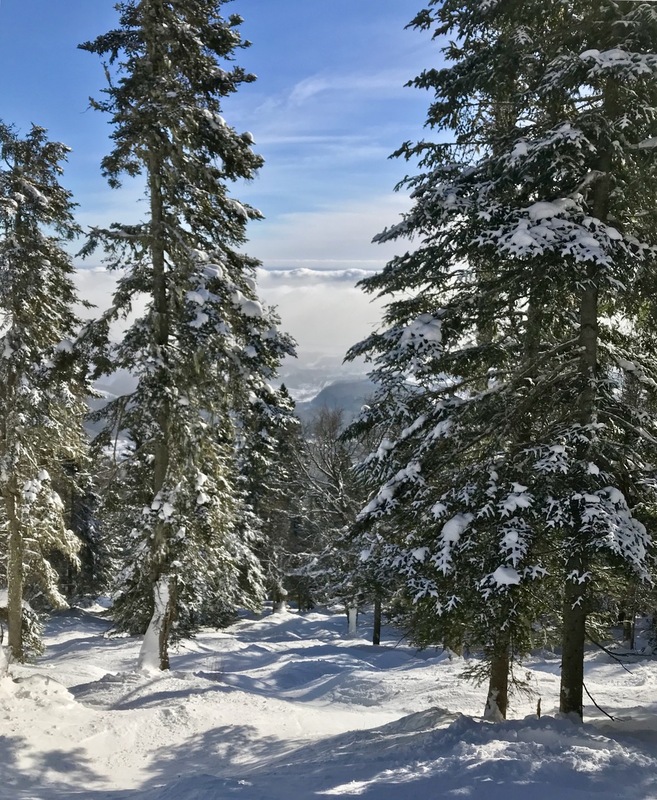 My favorite runs were La Skinusite and La Cathédrale, both steep and wide-open glade runs beautifully speckled with tall spruce trees. I also enjoyed La Surprenante, a steep and menacing natural trail with several large cliffs. If I were to compare Massif du Sud to a stateside resort, I would say it skis a lot like Magic, but even steeper and with a lot more snow. 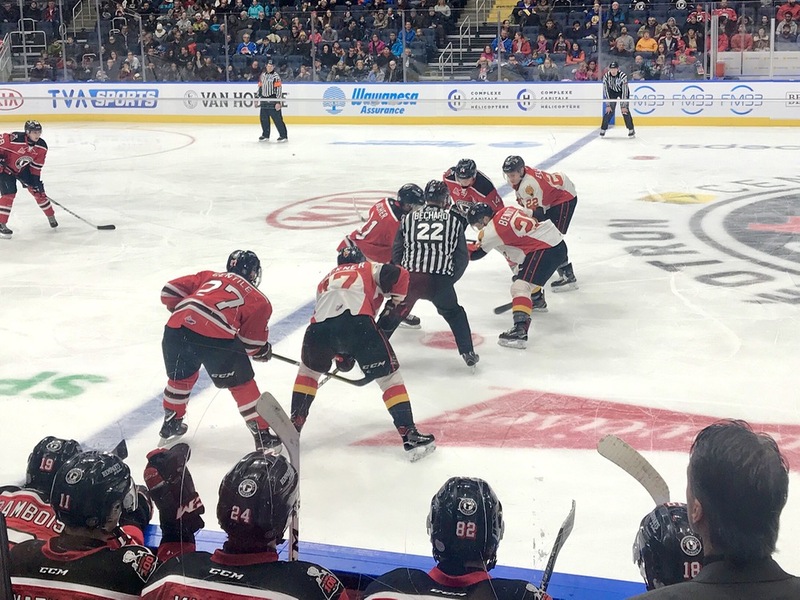 After some beer and poutine at the Sous-Bois Bar, I headed back to Quebec to meet up with the ladies for a hockey game. 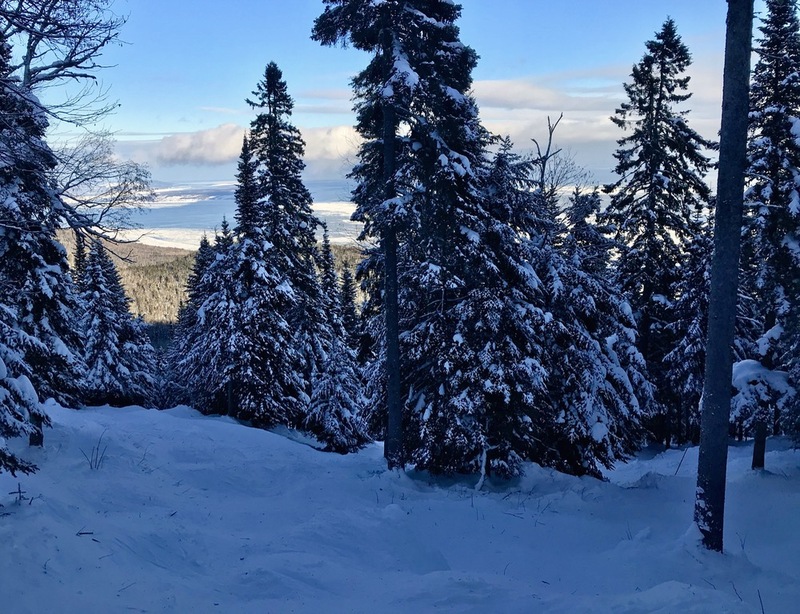 On our third and final day of skiing, Michelle joined me for the one-hour drive northeast along the river to Le Massif de Charlevoix, a towering resort that cascades down to the shores of the Saint Lawrence. While the views were great, the skiing was even better. We carved under the sun down wide, winding groomers and watched as the river grew bigger with each turn. While the double black terrain was still closed, I found plenty of fun and challenge in the glades and bump runs that covered every angle of the mountain, each one rewarding us with a different and equally dramatic vista. Even the lunch was remarkable—I’ve never been to a ski resort before where they serve homemade veal sausage, duck liver pâté and roasted salmon anywhere, let alone in the main lodge. 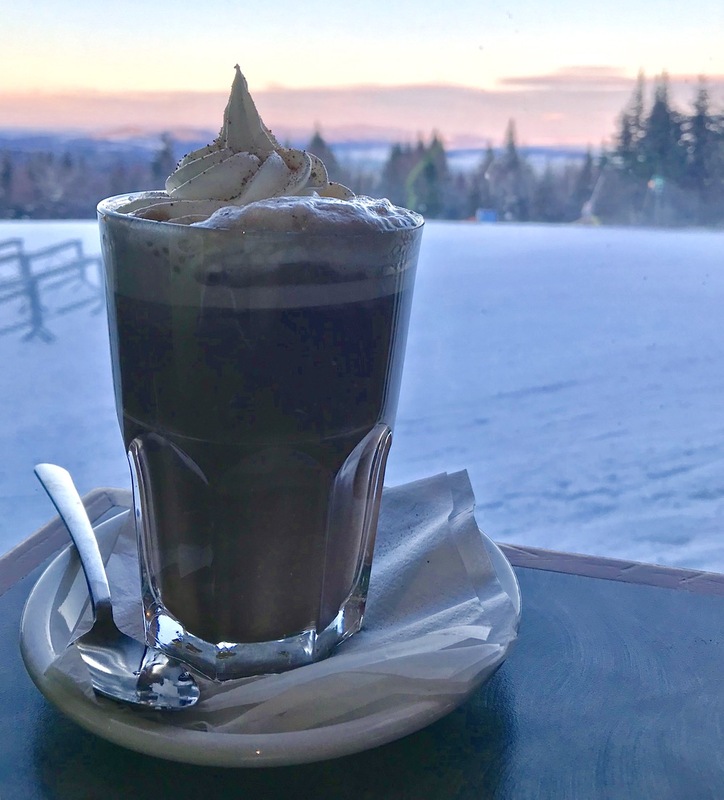 We finished the day with some boozy hot chocolates as we watched a gorgeous sunset paint the landscape purple, then we headed home to meet up with the other ladies for New Year’s Eve festivities. In spite of the challenging temperatures and infinitely long drive (it took us nearly 12 hours to get home the next day), everyone had an incredible time in Quebec and we all plan to return as soon as possible. 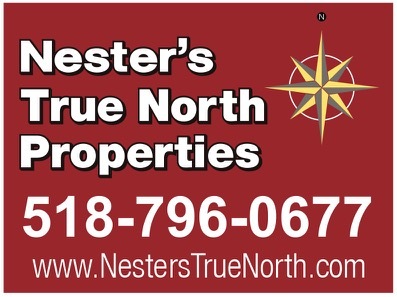 We nor’easters have a lovely piece of France-meets-Scandinavia sitting just to our north. Make the journey—you won’t regret it! Thanks. I’m thinking of heading up there after the temps rise into double digits. Skied the Boreal Loppet in Forestville, 180 east of Quebec City some years ago. Early March. -2 F, 20 mph wind. Glad you had a good time! Unless you have enough time to stop at several ski areas on the way up and back, that eight-hour drive is too much. I recommend the United nonstops from Newark (use FF miles). then rent a car in Quebec. I didn’t really mind the drive. Just have to take breaks every few hours to stretch your legs and enjoy the scenery.